The sun shone, and puffy white clouds drifted lazily across a blue sky when Vasilis was received into the Orthodox faith at St George Greek Church in Kingston. Unassuming from the outside yet wonderfully decorated with gilded iconography and a stunning azure blue ceiling within, it is not a place with which I was very familiar before photographing this Orthodox Greek christening, but I was very pleased to have been introduced to it as it has a lovely atmosphere. Unlike weddings, where group family shots are traditionally taken after the ceremony, I always like to get a good range of photos before a baby is baptised. 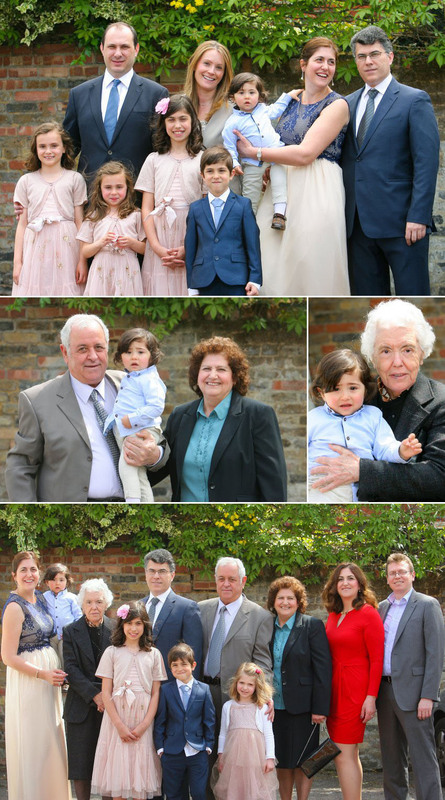 Even the most placid child can become tired and upset after so much attention, and I find that they typically have a sunnier disposition before the christening at St George Greek church in Kingston upon Thames. Vasilis is the youngest of three children and is it was lovely to watch his older siblings dote on him. We got some wonderfully relaxed family shots in the garden, including some with cousins and grandparents. As with so much of the Greek culture, family plays a vital role in pivotal celebrations, and the children were excited about getting involved at the right moment. One of the most important shots to get as a christening photographer is when the baby is submerged in the font. No matter how nicely the water is warmed and how experienced and gentle the priest is, most babies object to having an unexpected “bath” and being anointed with oil, and Vasilis was no different! However, these symbolic actions are at the heart of the experience and often turn out to be some of the family’s favourite images. As part of the ceremony, young children in the congregation are invited to walk around the altar three times, together with the priest, Godparents and baptised child. Vasilis’ sister and cousins looked beautiful in their matching dresses. Together with Vasilis’ brother, they carried out their duty with a touching maturity, and I thought again how lucky Vasilis was to have such loving siblings with whom to grow up. A child receives not one but three holy sacraments during a Greek Orthodox baptism. The first is Baptism, when the baby is undressed and immersed in a deep font where he or she is symbolically washed clean of Original Sin and reborn in the Church. The second sacrament is Chrismation. It takes place immediately after immersion and involves anointing the child with holy oil as a representation of being blessed by the Holy Spirit. The third sacrament, and the only one which will be repeated throughout the child’s life, is the Eucharist. The family had decorated a nearby hall with blue balloons and Greek flags for the post-Christening reception. The cross on the Greek flag represents the importance of the Orthodox church in the Greek culture, so it was a fitting decoration for an auspicious day. Clearly tiring after all the excitement, Vasilis was happy to be back in his mother’s arms. We took a few final shots of family and friends, capturing the sense of love and happiness that surrounds this beautiful boy.